The 2nd Round at the World Grand Prix of Darts. We remain level from our opening round selections as two of the four picks came in at 4/5 & 11/10. Onto round two with a further four selections spread over Tuesday and Wednesday evenings sessions. The first player through to the quarter-finals will be either 'the raging bull' Terry Jenkins or 'Big Ben' Benito van de Pas as two players at either end of their darting careers clash. Veteran Jenkins fought back from the brink to beat James Wade who was our ante-post selection this week and he has a real opportunity to progress further. Benito had a slightly easier assignment in dumping out an off form Gerwyn Price and this game has the makings of being a very good one. The market that appeals is for Terry Jenkins to get the most 180's at 5/6 with Skybet, Coral, or Betfred where TJ can hit a purple patch on tv in this department when in front or chasing the game whilst his young Dutch opponent's throwing style, in particular his high grip on the stem often means his darts enter the board at strange angles which in turn results in regular visits to the 19's cover shot ruling out many 180 possibilities. This round is extended to a best of five set format and Jenkins can win the 180 count in a match that could go either way in terms of progression. This match is another on paper that could go either way and coolness under pressure could win the day, something I have been very impressed with over the past few months from Kim Huybrechts who has wracked up some close fought wins on the Euro tour recently. Huybrechts was a straight win selection from round one at 4/5 and I am happy to side with him again at the same price where he is 4/5 general to beat Stephen Bunting who got the win over defending champion and out of sorts Robert Thornton but didn't play great in the process and feel the Belgian Ace Huybrechts is worth siding with here. Two players who are not frightened to use the whole of the board take to the stage first up on Wednesday night to determine who advances to the last eight. 'The Wizard of Oz' Simon Whitlock is flying right now, a 6-3 victory over Michael van Gerwen on route to his first PDC tour title since 2014 on Saturday will set him up nicely for this TV event and a round one victory over the inform Joe Cullen 2-1 will only add to his self-belief. Norris beat the eight seed Michael Smith last night however Smith was there for the taking being in such poor form and I don't see Norris being able to match Whitlock here. The beard of Simon Whitlock is to be feared once again and can take this where the 4/5 with Coral and Betfred looks a standout price. A slightly more speculative one but at the prices and how I see the match unfolding i am happy to include as good enough to be alongside the rounds strongest picks. Chizzy a former finalist here scraped through last night against the dangerous Robbie Green. Brendan Dolan's love affair with the City West Hotel's stage continued as he dumped out the number five seed Peter Wright and the 2011 Runner-up who famously hit the first televised 9 dart finish from a double start will not go down lightly against Chisnall. Dave Chisnall's 180's is set at 4.5 and is 5/4 with Bet365 and Skybet for the Overs which I like. The 8/13 under is based on the probability of a 3-0 whitewash for the 1/4 Chizzy but Dolan loves playing here as with the double start a leveller in the scoring department can see four or five sets played out and in doing so producing at least five maximums for the man from St Helens. 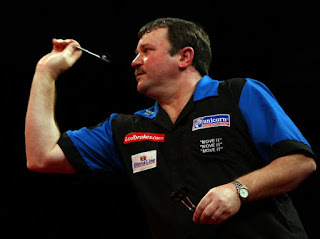 Terry Jenkins to get Most 180's v Benito van de Pas @ 5/6 Skybet, Coral & Betfred. Kim Huybrechts to beat Stephen Bunting @ 4/5 General. Simon Whitlock to beat Alan Norris @ 4/5 Coral & Betfred. Dave Chisnall Over 4.5 180's @ 5/4 Bet365 & Skybet or Evs Coral.